Have you ever walked down the deodorant isle and went: "What do I choose? There are too many options! What is going to give me the best protection from sweat and odor?". I know I sure have. I think the thought of smelling like sweat is always on the front of our minds, especially when we are in a professional atmosphere or need to make a good impression someone. Well, let me tell you there is a product that can save you from all of that headache. It's called Secret Clinical Strength. You can read a little more about it below, then I'll tell you what I thought when I picked some up for myself at Walmart. 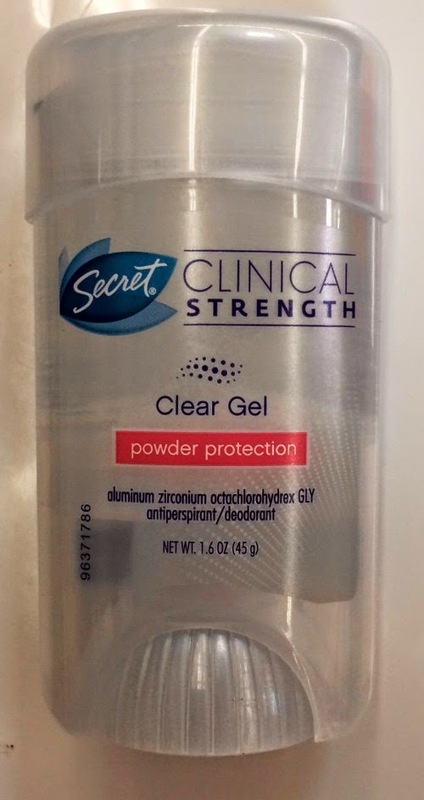 Moisture activated, and formulated with odor neutralizing ingredients that release a fresh scent, Secret Clinical Strength is proven to give you 4X* the protection against stress sweat. You can feel confident that Secret Clinical Strength will provide stress sweat protection regardless of what the day brings. Visit www.nostresssweat.com for the scoop on stress sweat! 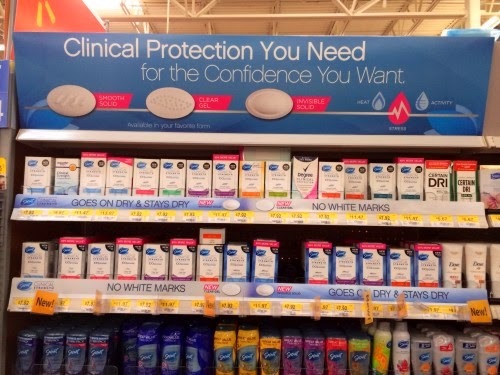 *vs. wetness protection required of an ordinary antiperspirant. Have you every wondered why stress sweat smells worse? That's because sweat caused by physical activity and temperature is produced by eccrine sweat glands, and is 99% water and 1% nutrients >But stress sweat produced from the apocrine gland increases bacterial, and Water + Nutrients + Bacteria = Odor. • Completely Clean, Powder Protection, Ooh-la-la Lavender, and Sport Fresh. • New! Clear Gel (no white marks), New! Invisible Solid (goes on dry and stays dry), and Smooth Solid (contains skin smoothing conditioners). Like most I was skeptical about any specific brand being any better/worse than another other. So when I was given the opportunity to try out the Secret Clinical Strength I thought sure why not? I first went online and read a little about each of the formulas and scents, then headed to my local Walmart so I could check them out myself. 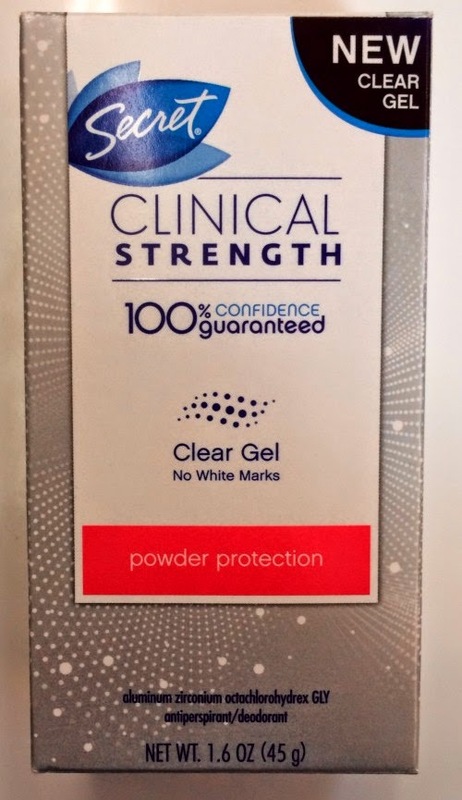 I finally decided on the Clear Gel - Powder Protection because I like knowing there won't be any white marks left behind if I accidentally hit my clothing. And because I like the scent of fresh powder. Right off I thought there must be something special about this product, it has it's own individual box. Well, after using it for a few weeks, I was right. It is pretty special. We had a few days were the temperatures finally got warmer and I had left the house in the morning with a mid-weight jacket on, and by afternoon I could feel myself warming up quite a bit. I didn't notice however any type of sweat starting to form under my arms, or the start of any sweat smell. So far so good. Now I'm actually looking forward to one of those really hot days where you can't escape the heat just so I can give this stuff a real test! I have to say it felt good knowing I didn't have to worry about my underarms for once as my busy day "heated up". Win it: One lucky reader will win a $25 Walmart gift card. This giveaway will end May 8th at 12:00 AM EST. The winner will have 48 hours to respond to my email. If no response, a new winner will be chosen. Open to residents of the US. a Rafflecopter giveaway Disclosure: Thanks to PR Firm/sponsor I was provided with this product(s) for the purpose of my personal review. The Walmart gift cards and information have been provided by Secret. This blog post is not a paid post and the honest opinions stated are my own. This giveaway is in no way associated with Facebook, entry via Facebook like is completely optional. Please allow 4-6 weeks for prize delivery from the sponsor.